A typical Lenny's interior: clean, pleasant. Usually busier... .
I’m a big fan of the Lenny’s sandwich chain. They’ve got a winning (albeity a bit pricey) formula. 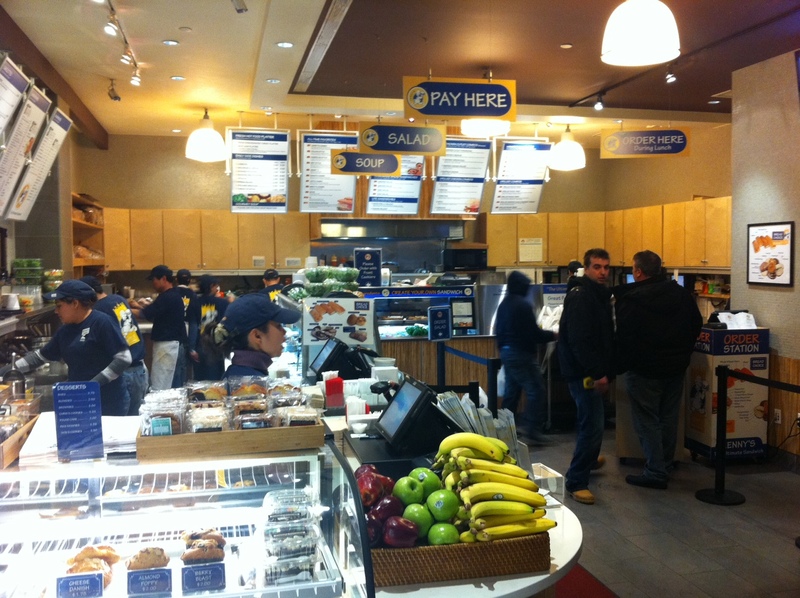 Their sandwiches are consistent, their operation clean (for a chain). 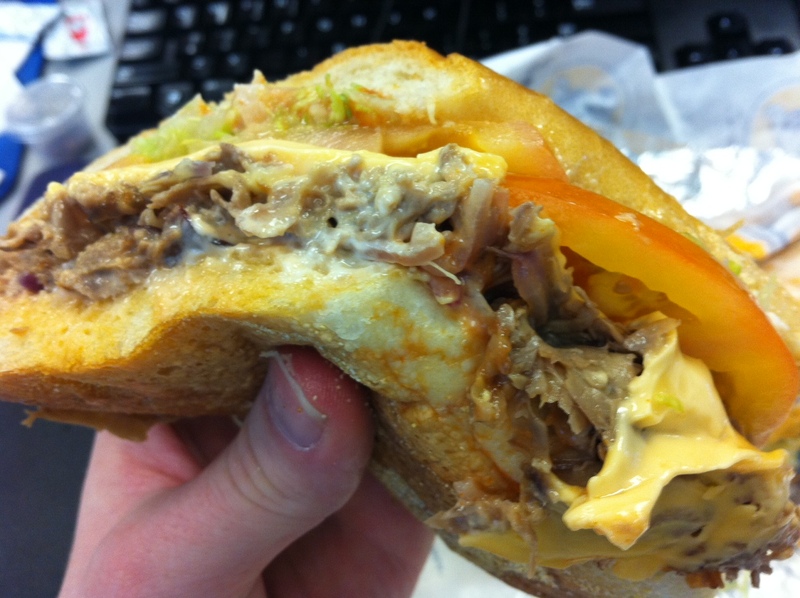 I know it’s a popular lunch spot already, but I’d like to shine a light on my favorite item on their menu, the Mikey’s Combo, which is silly, sloppy fun. The Mikey's Combo, at rest. 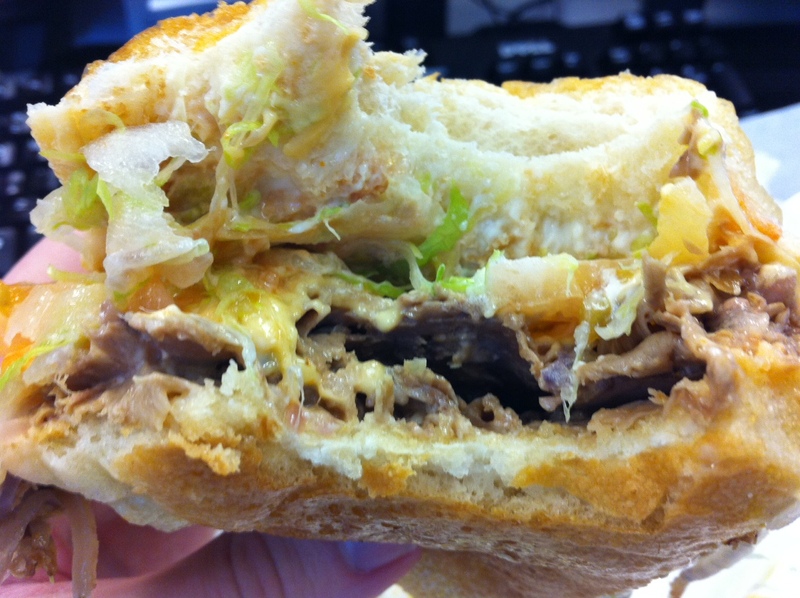 Mikey’s Combo consists of grilled roast beef, melted American cheese, lettuce, tomato and grilled onion. I like to add a few things when ordering, namely ketchup, mayo and oil & vinegar dressing. I get the whole thing served on a hero. 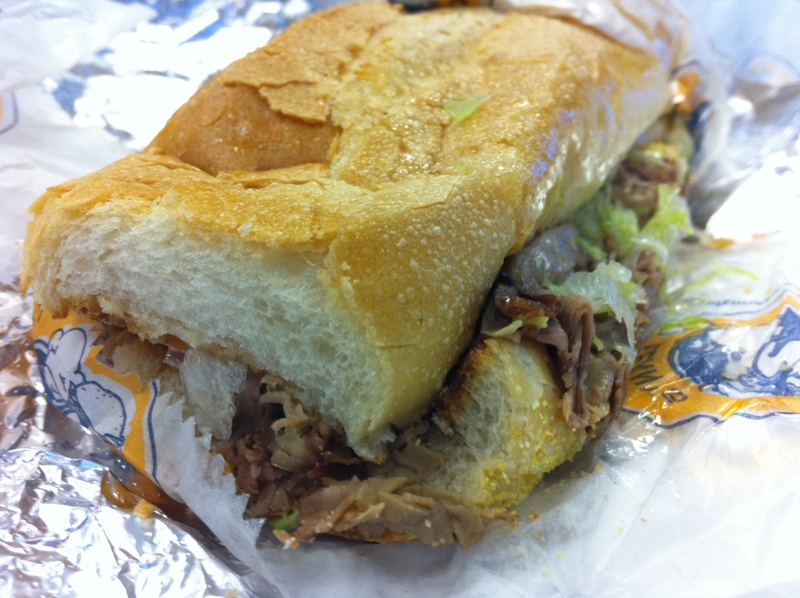 I think of it being somewhere between a cheesesteak and burger prepared in a hero style. Of course, the roast beef flavor is present, shattering that illusion, but nonetheless, it’s pretty good. The combo can barely be held without getting messy. The result of all that piled-on add-ons is a messy, large, comfort food special. It is difficult to pick up without at least one of the numerous ingredients dripping out one side or another at a time. Your fingers will get covered at one point. The shredded lettuce and grilled onions mellow out the thinly cut, grilled roast beef. The melted American cheese is pretty decadent. The mayo and ketchup fill out the sandwich’s flavor (and the hero roll also adds something), and the oil & vinegar bring everything into a slippery, drippy mess (while also punching up the flavor of the lettuce, tomato and onions). You can see it is not very dietetic. That said, Lenny’s has played an important roll in my diet (which now seems to be more about treading water rather than losing weight). They have a salad station, and I like to get some of their chicken salad stirred in (along with cucumbers, celery, carrots, onions and sometimes tomato, a touch of oil and balsamic vinegar). Their chicken salad has a wonderful, full flavor (it is pretty heavily mayoed, admittedly). Either way, putting the delicious chicken salad in a lettuce bowl with those mixes gets me the full flavor I like for lunch minus the devil white flour, so… . All in all, I am pro Lenny’s. Keep up the good work.